“Zapiski o iuzhnoi Rusi” is a two-volume collection of folklore, literary works and historical materials, edited and published by Panteleimon Kulish in 1856-1857 in St. Petersburg in two volumes. 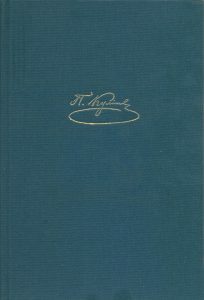 This first academic edition of Kulish’s study of Ukrainian folklore and ethnography contains a new materials, complemented by carefully elaborated variations of Kulish’s texts, based on numerous sources, Prof. Vasyl Ivashkiv thorough article and commentary on the writer’s body of work, indices of names and geographical names, and illustrations. “Zapiski o iuzhnoi Rusi” is not only the study of folklore, but it is also a monument to linguistics. It is here that for the first time the so-called “Kulishivka” – the first phonetic alphabet, which forms the basis of modern Ukrainian spelling, is used. This is publication is a project of the Krytyka Institute and funded by Ukrainian Research Institute Harvard University and the Shevchenko Scientific Society Natalia Danychenko Endowment Fund with the assistance of the National Academy of Sciences of Ukraine T. Shevchenko Institute of Literature.